Green beans are one of my favorite parts of the summer season. Fresh and tender green beans make a perfect pair to any meal. Lovingly hand-picked local beans are much more likely to be unbroken and unbruised, keeping moisture and nutrients in. And, as usual for tender summer veggies, nothing tastes as good! But, there are some things you should know about green beans. GROWING: Beans produce numerous harvests from the same plants, and take well to summer heat if watered enough. SHOPPING TIP: Good fresh beans should be firm and SNAP when you bend them. You can buy ‘em big or skinny, but avoid ones that have big bulgy beans under the skin, which might mean it’s overgrown and tough. VITAMINS AND MINERALS: Very high in vitamin K, which helps blood clotting and bone strength, plus vitamins A, C, some potassium and iron. 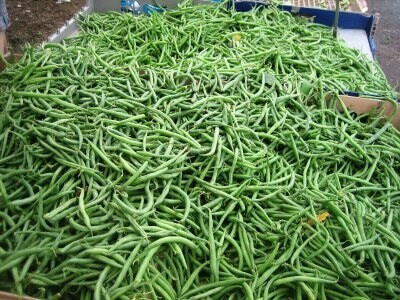 STORAGE: In a bag in the fridge, green beans will last 4-5 days before they begin to loose their crispness and nutrients. – Rinse in cool water, then snap the stem-end off. No need to snip the curved, pointed end – it’s perfectly tender, and pretty too. Modern varieties are bred without strings along the bean-side, but with an heirloom variety, you may need to peel it away when removing stem end. – Steaming preserves vitamins more than boiling. Place prepped beans in a steamer or strainer set into a large pot of water. Cover and bring water to a boil. Test one after 5 minutes; larger beans may need longer. – Stir-frying, a.k.a sautéing: heat a tablespoon of oil in a skillet over fairly high heat, & add prepped beans. Stir almost constantly for about 3 minutes, until they turn emerald green & are just cooked through. – Chilled for salads: Steam beans, and once beans are barely cooked – still a little crispy – run them under cold water to cool and set color. Spread out on a dishtowel, gently patting dry. – Serve chilled over green salad with toasted slivered almonds and your favorite dressing (simple vinaigrette is nice, as are buttermilk or ranch). – Toss barely-cooked beans in a spoonful of pesto, tapenade, or aioli. – Freshen up a holiday classic for summer – sauté green beans with a handful of quartered mushrooms. Stir in a dollop of sour cream, season, and top with a sprinkling of canned onion rings. I’ve got a great salad recipe for you that can be prepared in a snap! 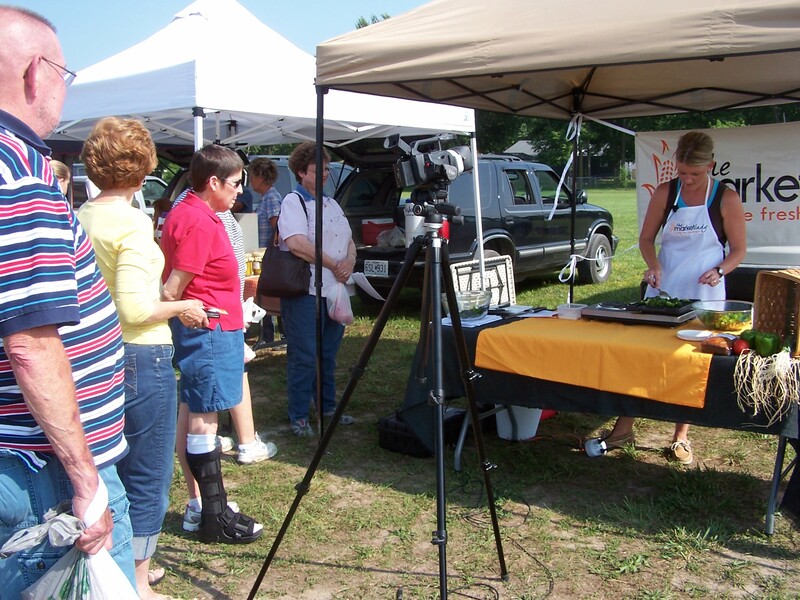 Watch for the green bean cooking demo at the Greater Springfield Farmers Market on July 19. Come on out to the market and watch our demo and learn about local foods. In a bowl big enough for everything, stir together vinegar, olive oil, shallot or onion, tarragon (or other herb), and salt and pepper to taste. Cut tomatoes in half (or use diced regular tomato), and stir into dressing. Steam beans until just cooked – keep them on the crisp side. Cool off as above. Just before serving, stir beans into tomatoes & serve (if you do it ahead, the beans will go army-green, not so pretty).